Fast Core i5! Ready to connect to your Wifi! 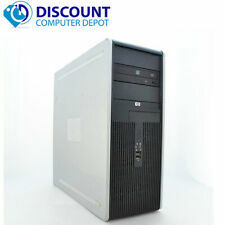 Clean and tested HP Compaq Elite 8200 ultra slim desktop PC USFF. 256GB SATA 2.5 TLC Solid State Drive (3D SSD) 1TB 7200 rpm SATA (6.0 Gb/sec) - hard drive. 8 GB dedicated Nvidia GeForceGTX 1070 GDDR5 [DL DVI-I, HDMI, DP, DP, DP] - 5Monitor capb. 1TB hard drive and 256GB solid state drive (SSD) for a blend of storage space and speed. AMD Radeon RX460 (4 GB GDDR5 dedicated). HP Envy Curved AIO 34-A010. HP Envy Curved 34-A010 All-in-One PC. 16GB DDR4-2133MHz SODIMM (2 dimm). 4GB dedicated GDDR5 AMD RadeonRX 460. HP ENVY 34" Curved All-in-One Computer: Watch your favorite movies and TV shows on this all-in-one computer's 34" curved display, which presents a vivid 3440 x 1440 Quad HD picture. Model: HP Compaq Presario SR5433WM. This has an upgraded graphics card…we added a Radeon R7 graphics card which has vga, hdmi and dvi inputs. PC also has wireless built in as well as USB 3.0 SS ports on the top (rear usb ports are regular 2.0. ). 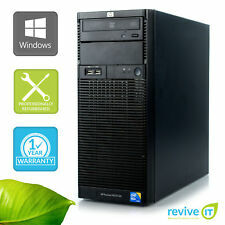 HP Pavilion Slimline 400-034 Desktop PC with Windows 8.1. Windows 8 has been updated to 8.1. Hard drive contains original system recovery partition (Windows 8). Integrated 10/100/1000 Gigabit Ethernet Wired LAN. 4GB RAM 160GB HARD DRIVE. HP ELITE 8100 Pro CORE i3 3.10GHZ. DESKTOP COMPUTER Wifi READY. Genuine Microsoft Windows software preinstalled. We professionally refurbish computers to Microsoft's strict standards. 8GB RAM 500GB HARD DRIVE DESKTOP COMPUTER. HP ELITE 8100 Pro CORE i3 3.10GHZ. Wifi READY. Genuine Microsoft Windows software preinstalled. We professionally refurbish computers to Microsoft's strict standards. Huge 500GB HDD Ready to connect to your Wifi! 12GB RAM 500GB HARD DRIVE DESKTOP COMPUTER. HP ELITE 8300 Pro CORE i5 3.20GHZ. Genuine Microsoft Windows software preinstalled. Keyboard and mouse included. by a Microsoft Authorized partner. We professionally refurbish computers to Microsoft's strict standards. Intel Quad Core I5-2400! 1GB Dual Video Out! Clearance!! Fast Core 2 Duo CPU! Excellent Condition with a Full 1 Year Warranty!